Feeling Fearless? 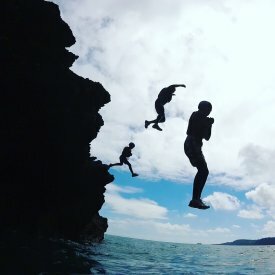 Rock Solid Coasteering will get your adrenalin pumping as you learn how to boulder over tricky coastal terrain combining a variety of skills - swimming, jumping, climbing. Run by Maidencombe's award winning adventure specialist and knowledgeable lifetime local, Ziggy Austin, his tailor-made coasteering routes can be adapted to all abilities and are suitable for individuals or large groups. He can even personalise them for special celebrations.